Do you ever miss out on business you deserve to win? Or struggle to explain what you offer to prospective customers? Winning new business isn’t easy, but in order to succeed you must be clear about the true value you offer so that people actually want to buy what you are selling. This book provides a practical guide to help convey your commercial value to new and existing customers. “I just read your book Value from cover to cover. It is a wonderful book, clear, funny, compassionate and packed full of ... value! As I turned the pages, I felt like you were speaking precisely to my dilemma and that, instead of looking outside of myself for answers, I found in your words a guide to take me back to what I know and find its value. Get ready to re-compete for your most important contracts and customers. If you’re a CEO, business owner or senior manager with revenue responsibility, Winning Again is a must-read guide to the complex issue of re-competing for work you already have. It offers tools and strategies to beat incumbency disease, make competitors irrelevant and stay no. 1 with your most important contracts and customers. "Today we pitched for a $140k account where we were unsuccessful 3 years ago. Before that we had held it for 6 years, and then THUD!! - we lost. We repitched today using what I learned through Winning Again, and for the first time in 18 years of business got a call back on the same day saying we had won! Thank you Robyn!" 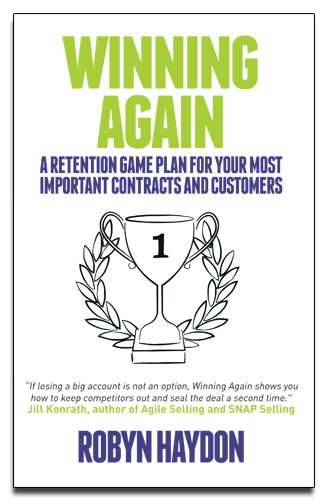 "Winning Again offers solid advice on how to retain business again (and) holds universal truths for any company wishing to keep a client." Finally! A book about proposal-writing that’s refreshingly honest, entertaining and tells it how it is – from a supplier’s point of view. Put yourself in the customer’s shoes, with dozens of proposals to assess. It’s a daunting and difficult job. Despite the hours you have spent writing your proposal, it’s just one among many. What does it take to be successful in this hyper-competitive environment? What will make your proposal rise to the top of the pile? Through a series of examples and anecdotes based on real-life problems, proposal writing expert Robyn Haydon explains why most proposals end up on the reject pile – and how to make sure yours is a winner.